“The Definitive Story of Mickey Mantle” | ninety feet of perfection. 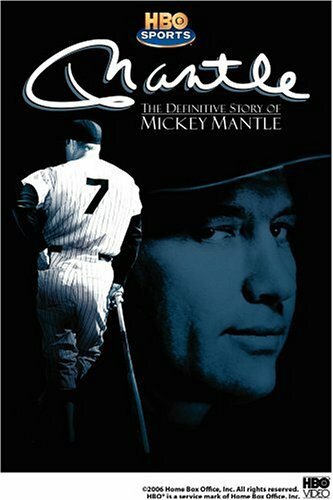 I recently finally got around to watching the HBO Sports Documentary “Mantle – The Definitive Story of Mickey Mantle” DVD and I got to say it was done pretty well. The movie is 5 years old and I have always meant to watch it and I now feel I cheated myself by waiting so long. The film makers did a good job of humanizing Mickey by showing both the negative and positive aspects of his life through many interesting interviews, video footage and photographs. They did a great job of capturing his amazing career as a New York Yankee superstar adored by all as he conquered everything in front of him on a Baseball field. At the same time the documentary captures the injuries that plagued his career and the pain was with him almost every day of his career as he most likely played 17 years with a torn ACL amongst MANY other injuries. The footage of him limping across the base paths and while taking position on the field is saddening and makes you think what could have been done to ease his pain with modern medicine and medical breakthroughs. Also, it would not be a a proper documentary of Mickey if it did not capture his battles with alcoholism which in the long run did him in. On a different note, one aspect of the documentary that I could have done without was comedians such as Billy Crystal & Richard Lewis being interviewed. With other players such as Whitey Ford, Yogi Berra, and Bill “Moose” Skowron also being interviewed I can’t complain too much. It would have been great to get a interview from the late Billy Martin in there as there has to be some that exist. As I assumed, Bob Costas was interviewed as he developed a friendship with Mickey at the end of his life. Costas hosted Mickey’s last nationally televised interview in addition to delivering Mickey’s eulogy at his funeral. I have always liked Costas and enjoyed his takes on all things Baseball and my opinion still stands. Mickey Mantle has always been one of my favorite “classic” players ever since as a child I asked my Dad who some of his favorite players were as a kid. I think initially I loved the fact his name was “Mickey” but as soon as I got a little older I soon realized how great of a Baseball player this switch-hitting Center fielder from Oklahoma was and after watching this documentary my appreciation of him as a player still grows. ~ by duaneharris19 on October 19, 2010.